There are many reasons to rent a floor scrubber or a floor sweeper. Perhaps your current floor cleaning machine is down, or you don't own one and simply want to perform a deep cleaning of your facility. No matter your floor cleaning needs and budget, Factory Cleaning Equipment is your best choice for industry-leading sweeper and scrubber rentals in Illinois, North Carolina, and surrounding areas. Floor cleaning rentals in the Midwest, including Chicago, IL, Rockford, IL, Davenport, IL, Milwaukee, WI, Madison, WI, South Bend, IN, Lafayette, IN, and more. Are you outside of the highlighted area? We still may be able to rent to you! Contact us now and tell us where you are located. Floor cleaning rentals in the Southeast, including Charlotte, NC, Raleigh/Durham, NC, Asheville, NC, Winston Salem, NC, Greensboro, NC, Rock Hill, SC, Columbia, SC, and more. We have a wide variety of industrial scrubber brand names to choose from such as Bulldog, Factory Cat and Tennant. 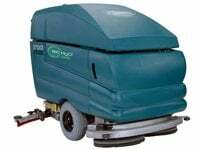 Tennant is our most popular brand of rental equipment as they are the leading manufacturer of Industrial floor cleaning equipment and have the widest variety. If you are unsure of what kind of machine you need, give us a call and we will be more than happy to help. With over 20 years of being in business, we have the ability to recommend the correct machine to each customer. Battery powered self-propelled sweeper that sweeps up to 30,000 square feet per hour. Picks up fine dust, chunks of wood, metal, rocks, etc. 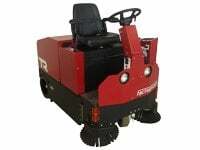 A great sweeper rental for warehouse clean-ups, move outs, or getting ready for important visitors. This machine works on any hard surface. Sweep up to 40,000 square feet per hour and clean up to 160,000 feet on a single charge (depending on conditions). This is a great sweeper to rent if you are sweeping up larger areas, but need a machine that will fit through narrow aisles and tight spaces. Equipped with a removable hopper that rolls out for easy dumping of heavy debris. The Tennant S30 and 6600 sweepers were built to sweep large areas like warehouses, manufacturing plants and parking lots. Rent these sweepers when you have construction clean ups, dust problems, or need to clean up parking areas. All propane sweepers have powered high dump, making them easy to empty into dumpsters and other containers. This compact, battery operated scrubber is an excellent machine for areas of your facility that are close in quarters. Extremely simple to operate, there is very minimal training involved. Rent this scrubber when you know there will be many obstacles to avoid while cleaning the floor. 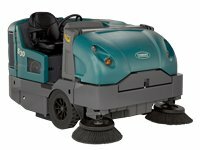 This scrubber rental will run up to 3 hours on a charge. 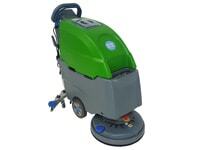 This powerful machine is a great scrubber to rent for many applications. 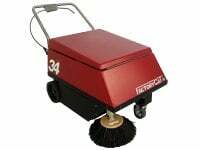 It can be used to clean large facilities with any hard surface. With the proper brushes and chemicals the Tennant 5680 and 5700 can both strip old wax from floors as well as prep concrete for coatings and sealers. This rental will run up to 4 hours on a charge. 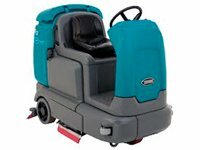 This heavy duty ride on scrubber is a great rental choice if you have large areas to clean, but require a more maneuverable scrubber for narrow aisles or tight spaces. 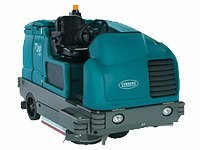 The Tennant T12 can be used to clean any hard surface and has enough power to strip years of build-up from on a floor's surface. This machine runs up to 4 hours on a charge. 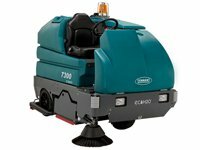 Rent the Tennant 7300 scrubber when you need a large rider scrubber/sweeper that is battery powered. This machine has the power and capacity of large propane powered equipment yet runs on industrial forklift batteries. It can clean up to 200,000 square feet on a single charge (depending on conditions). With front wheel drive and front wheel steering, this machine makes maneuvering into tight spaces a breeze. The Tennant T20 and Tennant 7400 are quite possibly the most powerful and reliable propane powered scrubber sweepers rentals available. Rent these machines when you have large areas such as warehouses, manufacturing plants, or parking garages to clean. With up to 600 pounds of available down pressure, these floor cleaning machines can power through almost any tough floor cleaning project.